Summary: A flawed but hugely enjoyable movie that proves there’s no need for the Brit horror movie to lay dormant. 28 Days Later… (not to be confused with Sandra Bullock rehab comedy 28 Days or you could be in for some real shocks) is a serious attempt to resuscitate the British horror movie and to wrestle the zombie genre away from the realms of splatter comedy and, thanks to Danny Boyle’s trademark visual flair and a pressure-cooker script from Alex Garland, it largely succeeds. Sure, it lacks the poster-campaign characters of Trainspotting and Shallow Grave, but more than makes up for it in a vivid depiction of apocalyptic England happily married to buckets of blood. The backdrop is perhaps particularly topical in the wake of SARS. The film opens with a band of animal rights activists bursting into a science lab to free some edgy looking chimps, unaware that the animals carry the most deadly virus man has ever known…28 days later Jim wakes up in a mysteriously empty hospital. He stumbles out dazed, and indeed confused, onto the streets of London and finds it apparently deserted. But when the sun goes down figures do begin to emerge, wild-eyed and hungry for blood – the virus, dubbed ‘Rage’, having triggered some serious complexion issues in the country’s population. With little hope Jim happens across a few survivors and together they attempt to make it to an apparent army base in Manchester, having to use all their resourcefulness and wits to survive. Garland’s novels The Beach and The Tesseract both had more than a little cinematic immediacy about them and, after adapting The Beach for screen he appears to have embraced the movie form completely (and seemingly edged out John Hodge as Boyle and producer Andrew MacDonald’s favoured collaborator). Garland’s obviously studied his zombie flicks and he naturally draws in particular from George R Romero’s Night of the Living Dead trilogy with a hedonistic supermarket dash and the besieged army sexists recalling Dawn of the Dead and Day of the Dead respectively. Perhaps Garland hasn’t entirely abandoned his literary roots either, as the film is also somewhat reminiscent of novels The Fog by James Herbert (yellow fog turns British public into manic zombies) and John Wyndham’s Day of the Triffids (meteor shower turns humans blind and plants into remorseless killers). But the film makes a fair stab of bringing it up to date with a chilling depiction of how unprepared England is for catastrophe and showing the virus permeate all backgrounds and barriers. His themes are fairly clear – drawing parallels between the army and the zombies and suggesting the protagonists’ humanity (love, compassion, wit etc) is their key to survival. But while it maybe bleak (though not as bleak as Night of the Living Dead) this isn’t about existential ponderings on the human condition but rather about gory fun. Cillian Murphy and Naomie Harris hold the attention well enough, but their characters aren’t especially memorable. This only increases the feeling of isolation that carries the film however, and Christopher Ecclestone appears halfway through who helpfully manages to stay the right side of hamming things up. It is Danny Boyle’s verve that really brings this film alive. Shooting on digital video gives the film a grainy, naturalistic kind of feel perhaps recalling the way the matter-of-fact opening scene of Night of the Living Dead made it that much more disturbing. Yet the initial scenes in particular still manage to be eerily stunning in exploring an empty, wrecked London shot with disquieting camera angles that Orson Welles would be proud of. Boyle continues to pile on memorable images – zombies scrabbling over shopping trolley barricades at the bottom of a grim tenement block, a stark confrontation with a child zombie in a cafe– and more importantly keeps the tension and shocks in constant flow. The baby-on-the-ceiling scene from Trainspotting perhaps suggested Boyle’s knack for horror, and the film more than delivers. 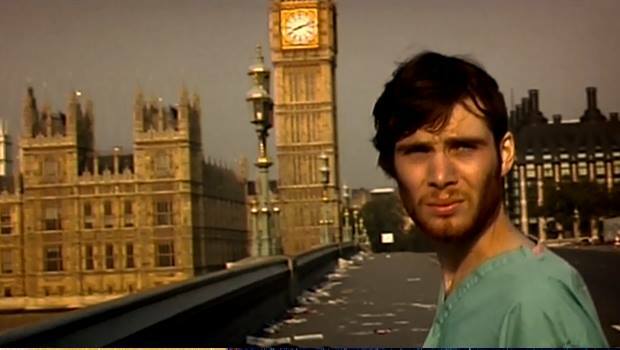 Sadly, there’s no denying that the second half of 28 Days Later… doesn’t quite live up to the thrilling first. It builds to its bloody climax in similar fashion to The Beach but like The Beach (in its movie incarnation anyway) it doesn’t quite ring true. Moreover it seems a little redundant to wheel on the army as bad guys when there’s a whole country-full of zombies to contend with. Luckily the tension is so well constructed this doesn’t dampen the film greatly and with a few nasty sequences before the end it doesn’t matter too much if the film doesn’t descend into the mass-zombie-lawnmowering of Braindead. 28 Days Later… then is a flawed but hugely enjoyable movie that proves there’s no need for the Brit horror movie to lay dormant. Settle down with a couple of lagers and a fresh bowl of pickled brains and this could be the most fun you’ve had in a rather long time.